Seven Seas was successfully delivered to its owner one month ahead of schedule in November 2010. The 86m yacht built under the project name Y706 follows in the legacy of Oceanco’s thriving Y700 generation that includes award winning yachts such as Amevi, Alfa Nero, Anastasia, Vibrant Curiosity, and Sunrays. 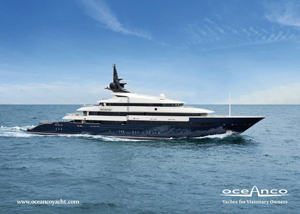 Oceanco in combination with the designers Nuvolari & Lenard, Azure Naval Architects and the Wright Maritime Group have created an outstanding yacht. Catering to the owner’s specifications, this yacht includes some interesting features. The main salon is fully equipped with a professional projection system and 5m-by-2m screen which, coupled with two rows of raked seating, will transform into a screening theatre. Adjacent to the main salon is an imposing 250-metres-squared area which can host everything from casual al fresco dining to a black-tie gala. A tempting feature is a projector which will throw an image onto the glass wall of the aft infinity pool allowing you to watch a movie without leaving the swimming pool. Seven Seas, powered by dual 4,680hp/3,492 kW MTU engines can reach speeds of up to 20 knots providing both performance and comfort.